Falen was born and raised in Fairfield, Alabama, a suburb of Birmingham, and she is a product of the Fairfield City Public School system. After graduating high school she enrolled at Jacksonville State University in Jacksonville, Alabama where she was parliamentarian of the Student Government Association (SGA), and School Delegation Leader for the YMCA’s Collegiate Legislature. She was named SGA Senator of the Year in 2006 and 2007. She graduated, with honors, in the spring of 2007, earning a Bachelor of Science degree in Criminal Justice. In the fall of 2007, Falen enrolled at Mercer University’s Walter F. George School of law. At Mercer, Falen joined the Black Law Student’s Association where she served as 1L representative, community service chair, and parliamentarian. She was also a member of the Mercer Advocacy Council where she represented Mercer Law in moot court competitions, winning Best Brief and First Place team Champion at the Charleston School of Law National Moot Court Competition in 2009. In addition to serving on a moot court team herself, she served as Vice Chair of Client Counseling and Negotiations in 2009-2010; that year her team won second place at the South Regional American Bar Association’s Client Counseling Competition. During her summer breaks, she interned at the Georgia Innocence Project and the National Criminal Defense College. Upon graduation, she was inducted into the Order of the Barristers, a national honor society which recognizes graduating third year law students who have demonstrated outstanding ability in preparation and presentation of moot appellate arguments. Falen began her legal career at the Eastern Judicial Circuit’s Office of the Public Defender, and passed the Georgia Bar Exam during the fall of 2010. She first began as a junior attorney in the Early Intervention Program (EIP). Simultaneously, Falen was part of a two-member appellate division and represented clients on motions for new trial, and before the Georgia Court of Appeals and the Supreme Court of Georgia. Falen was promoted within a year, and assigned to represent clients in the Superior Court of Chatham County. In 2012, the Superior Court created the “major crimes division” to which Falen was immediately assigned, and she became the youngest attorney to serve within that division, where she practiced before the Honorable Chief Judge Michael Karpf. After two years Falen was promoted to senior trial attorney. 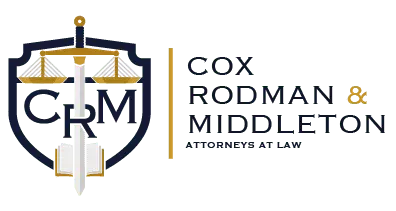 In January of 2017, after more than six years at the public defender’s office, Falen along with partners John Rodman, and Christopher Middleton formed Cox, Rodman, and Middleton, LLC, a litigation law firm practicing criminal defense, personal injury, family law, business formation, contract law, and employment law. In addition to supporting the community throughout her career, Falen seeks to empower women and the larger community through her various community affiliations. A member of the Port City Bar Association (PCBA)—a minority bar association for lawyers in the greater Savannah community—since 2010, she was elected to serve the position of secretary in 2015. In addition to providing support and opportunities for minority attorneys, the Port City Bar Association partners with the Black Law Student Association at Savannah Law School, leads small group sessions at the annual Megagenisis program, and hosts an annual Christmas toy drive. Falen founded and, and heads Best Foot Forward (B.F.F. ), a PCBA program, which mentors 8th grade girls enrolled in a local charter school. Each month, Falen spends about an hour with the girls talking about everything from courage to boys. Additionally, Falen lends her skills to the school’s board of directors, where she has previously served as secretary, and currently serves as Vice-Chair, and chair of the governance committee. Additionally, she serves on the Savannah Classical Academy’s Foundation board, which works to benefit Savannah Classical Academy. She frequently speaks about the importance of making good decisions at other schools within the Chatham County School system, and she has lectured at Savannah State University and coached students in mock trial and moot court at Savannah High School and Savannah Law School. She was selected to serve on the City of Savannah’s Code Enforcement Appeals Board in 2015. In 2016 she was selected to serve on Mercer Law School’s newly minted Young Alumni Council where she represents the class of 2010 and serves on the nominating committee.